I'll suffer through many things if the promise of a post-apocalyptic horror is on the cards. To that end, I've lived through such atrocities as I Am Omega, and once really tried to like Hardware. 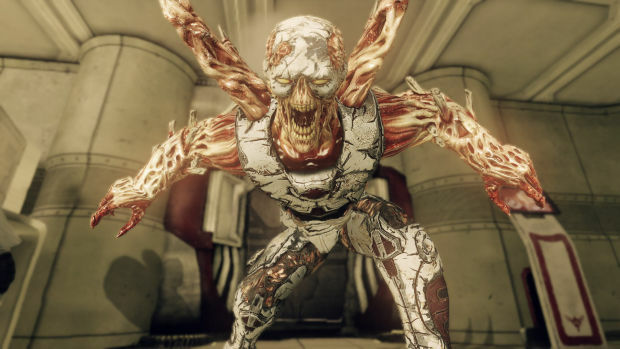 A game like Afterfall: InSanity seems right up my alley. The promise of treasure hidden under the dirt is hard to resist. Having played the Extended Edition thanks to Steam Greenlight, I can report it was not the buried treasure I'd hoped for, though it had every opportunity to escape its restrictions and be something uniquely enjoyable. It's certainly unique, and even does manage to be enjoyable for a considerable portion of the adventure. Then it all goes wrong, and never gets better. It is, indeed, the Hardware of videogames. 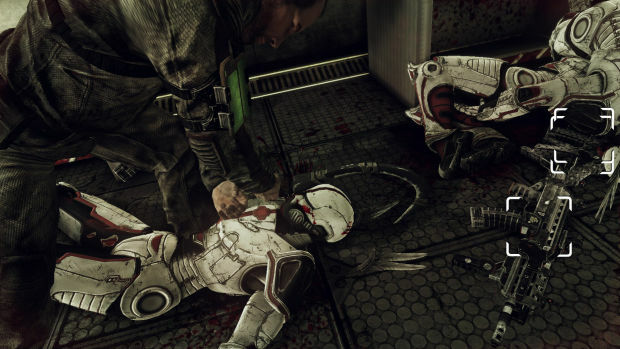 To say Afterfall: InSanity owes a debt to several of its interactive peers is to put it in the most diplomatic way possible. Borrowing heavily from Dead Space, Fallout, and Silent Hill, the story centers on one of humanity's few remaining survivors in the wake of a nuclear attack, eking out his existence as a psychologist in a claustrophobic, heavily governed shelter. Before long, spooky things start happening and all hell breaks loose, as denizens of the shelter turn into mutated, enraged monsters. Poorly voice acted, though to admittedly humorous degrees, Afterfall's plot really does feel like that of a straight-to-video horror flick, with production values to boot. Graphics are simplistic, animations stiff, and controls feel unwieldy. However, like those budget horror adventures that so often tempt us on "eight movies for five bucks" DVDs, there's a certain stunted charm to the whole affair. 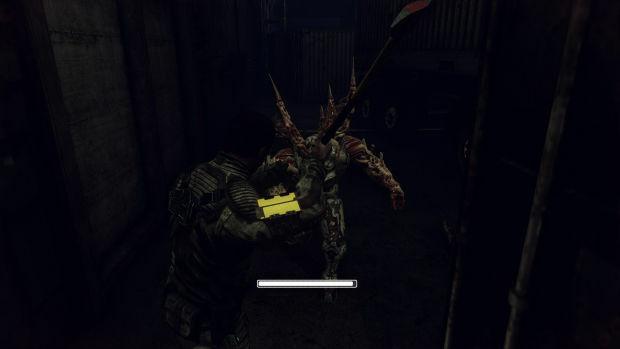 Indeed, for the first half of the game, Afterfall actually manages to be quite effective, utilizing its dark corridors and dirty aesthetic to produce something approaching scary. InSanity is an action game, fundamentally, with some light horror elements. Though our protagonist, Albert Tokaj, has access to pistols, assault rifles, and shotguns, ammunition is scarce and players will mostly rely on the many melee weapons scattered throughout the environment. Axes, batons, sickles, and table legs helpfully litter the world, and can be used to batter monsters, though the variety is mostly aesthetic, all weapons split evenly into both heavy and light, as well as blunt or bladed. Obviously, heavy weapons are slow, and bladed weapons can take off limbs. Any other differences are purely cosmetic. Combat is as simple as clicking the mouse until everything is dead. There's a block button and a dodge move, though defending is usually less effective than all-out offense. Tokaj's actions are determined by a stamina meter, and he'll be unable to keep fighting if it drains, yet stamina recovers almost instantly, so should be little more than an afterthought in most situations. Should it drain, Tokaj need only back away from the largely ineffective enemies to regain his strength in a handful of seconds. Every now and then, the action will be broken up by some simple hacking minigames or switch puzzles, the only challenging thing about them being the game's obfuscating, vague tutorial screens that make each puzzle seem more complicated than they actually are. Most hacking involves rudimentary memory games, pressing keys in the correct order using trial-and-error tactics. Restricted by a general low quality, both visually and interactively, Afterfall: InSanity utilizes the one thing it has going for it -- atmosphere -- to startlingly decent effect. The first half of the game, taking place in the isolated shelter of Glory, is well paced and does a great job of fueling one's paranoia. 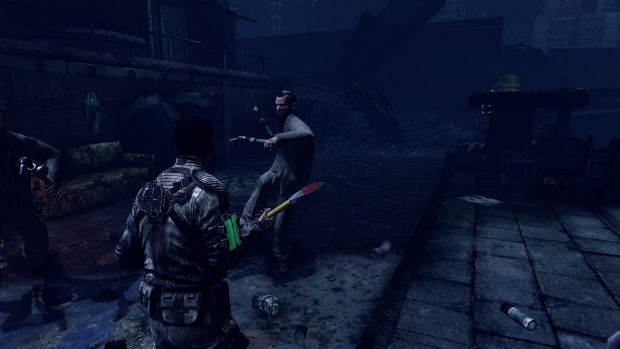 Dark corridors and churning machinery hide all manner of gruesomely designed mutants who, while not really all that threatening in a gameplay sense, are at least horrific enough in visual and sound design to provide some scares. It is through this savvy design that InSanity manages to transcend the limitations of low-budget development and become something with serious potential. The first half of the game, while clearly simplistic and more than a little rough around the edges, is still enjoyable enough, even if Tokaj infuriatingly drops his melee weapon on the floor every time one switches to a firearm. The story is at least interesting, if not delivered all that well, and the oppressive environment makes for a compelling adventure. In essence, it has everything required to be a diamond in the rough, a worthy experience in spite of its many flaws. Where this all goes wrong, however, is in the second half of the game, once Tokaj breaks free of Glory's reigns and reaches the blasted surface world. 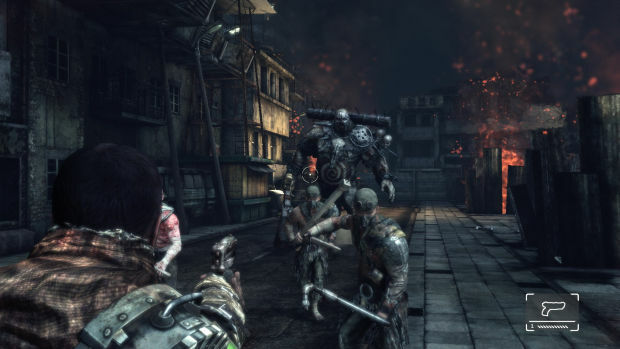 The horror elements soon give way to banal, Mad Max-inspired action sequences for which the game clearly was not designed. It's plagued by instant-death quick-time-event sequences with inconveniently placed checkpoints, and a narrative that cashes in all its previous build-up for a rushed tour of every post-apocalypse story cliche in the book. Here, guns become more important but the ammo count hasn't upped to counter it, infuriating enemies that can't be hit with melee weapons appear, and there are some excruciating boss fights designed to exploit the game's own dodgy physics to score cheap kills on the player. After all the goodwill accrued in the first portion of the game, InSanity indulges in its weakest elements to an overwhelming degree while unceremoniously eradicating anything it did well. Thus imbalanced, the game becomes practically unbearable to the point where it feels almost like a totally different title. 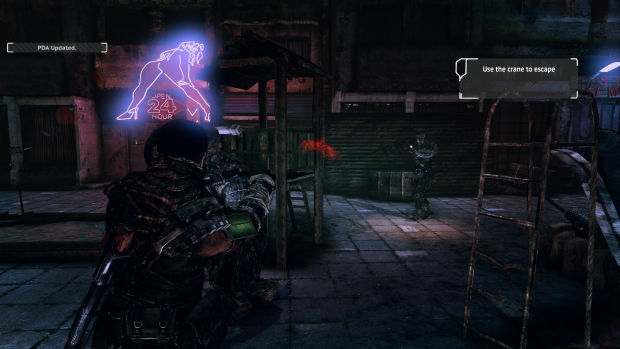 Quite why Intoxicate Studios felt the sudden shift in gears was necessary, I do not know, but the result is a dramatic drop that switches the entire adventure from forgivable to detestable. Rushed, sloppy, and exposing the game's already evident problems in magnifying detail, the closing half is an absolute destruction of the first half's achievements. I reached the final stages of the campaign before getting too sick of it to continue, and found little sanctuary in the "Dirty Arena" mode that seems to be an exercise in seeing how long you can get shot at before dying. There's not a lot else on offer, and even at a budget price of $19.99, I'd say the game fails to provide enough compelling material to be worth the plunge. InSanity was never going to be a great game. It would have struggled to be considered a good one. 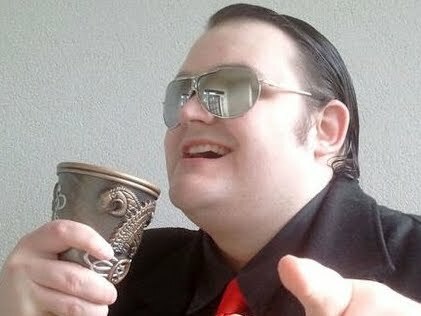 It did, however, have that certain special something, possessed of enough charisma to at least make me debate whether or not it was a bad game. That is, until the gear shift and rapid decline, at which point I gave up trying to be nice and settled in for an absolutely terrible time. It's a shame, because it had its hands all the tools necessary for underground success, but failed to prove itself consistent enough to stand out from all the other obscure, low-budget, bottom-feeding action games on the market.